Touch-Screen Laptop Package for $ 399.99 at BestBuy! The laptop package which includes HP 15-f100dx Touch-Screen Laptop, Internet Security Software, Screen Cleaner, Sleeve & Flash Drive Package is now available at BestBuy for the price of $ 399.99. The laptop features AMD A8-6410 accelerated quad core SoC that features 2 MB level 2 cache and runs at the base clock speed of 2.0 GHz with Turbo Core up to 2.4 GHz. SKU: 999923800005000. The HP Pavilion 15-f100dx touchscreen laptop PC features 500 GB Serial ATA hard drive that spins at the rate of 5400 rpm; 25 GB of Cloud storage provided by Box and an additional 25 GB of storage for 6 months via Dropbox; 4 GB DDR3L memory which deals with the multitasking ability of the computer; Digital media reader that supports Secure Digital format; Multiformat DVD ± RW / CD - RW drive and front - facing VGA webcam with integrated digital microphone. On the other hand, the Webroot SecureAnywhere Internet Security Plus 2014 (3-User) - Mac/Windows (model: 8103094) keeps you stay protected, whether you're travelling from your office to the bank, boarding a plane for a business trip or walking across campus, you're always on the go. And wherever you go, you will need a technology that will keep your line of communication open and your life managed. With this protection, you will be protected from phishers, viruses and other online threats. With the security features and blazing-fast, behind-the-scenes scans of Webroot SecureAnywhere Internet Security 2014, your PC, Mac and mobile devices stay automatically protected while remaining totally accessible, so you don't have to compromise safety for convenience. Moreover, Targus - Trax Laptop Sleeve – Black (Model: TSS677US) will be the one to shield your laptop with up to a 15.6" display. It features rugged neoprene material and a form-fitting design for durable protection. Also, the zippered exterior pocket lets you to bring along small accessories. The Insignia - 2-Oz. Screen Cleaner (Model: NS-MCYL52B) will be able to keep your screens free of smudges and fingerprints. It features an alcohol- and ammonia-free formula to help offer safe cleaning. The StorDry bottle safeguards the included cloth between uses. The SanDisk - Cruzer Blade 8GB USB Flash Drive (Model: SDCZ50-008G-B35) will keep important data always available at hand. It features an 8GB capacity for storing photos, videos, music and more. 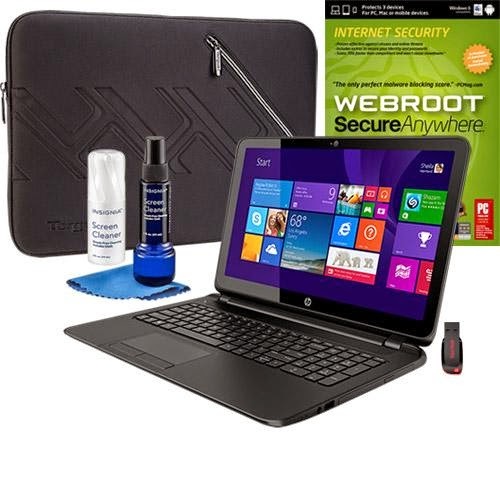 The HP 15-f100dx Touch-Screen Laptop together with the Webroot SecureAnywhere Internet Security Plus 2014 (3-User) - Mac/Windows; Targus - Trax Laptop Sleeve – Black; Insignia - 2-Oz. Screen Cleaner; SanDisk - Cruzer Blade 8GB USB Flash Drive can be had for the price of $ 399.99.